Yes, if your sense of humor is anything near mine, you may be grinning already, after reading the dialog above. 🙂 But, for the full effect, this entry in the Bad Comic Panels series requires a little more background. 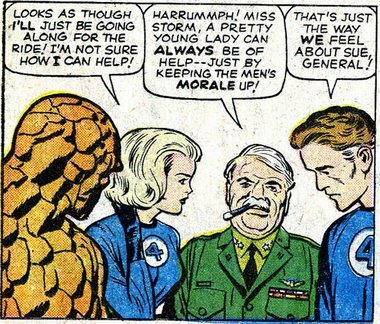 … a pretty young lady can always be of help — just by keeping the men’s morale up! That’s just the way we feel about Sue, general!